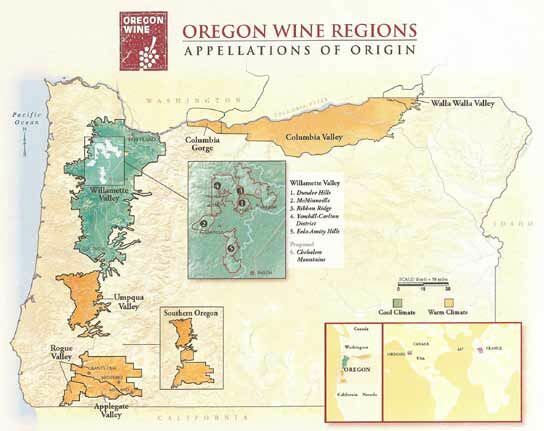 There are notable Pinot Noir producers in Oregon that are not in the famed Willamette Valley. 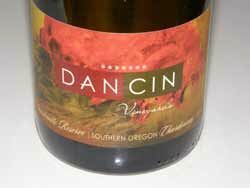 DANCIN Vineyards, located in the western forested foothills of Southern Oregon, is a good example. Dan and Cindy Marca studied viticulture for ten years and in 2007 they bought a 15-acre property near Jacksonville in the Rogue Valley. The site is near where pioneer Peter Britt started his first vineyard nearly 150 years ago, likely the first planting of Pinot Noir in Oregon. They named the estate DANCIN Vineyards after the first three letters of each of their names. The three vineyard sites consist of just over 19 acres with 67% planted to Pinot Noir (seven clones) and the remainder to Chardonnay. The site, situated at varied elevations between 1,700 and nearly 2,000 feet elevation, has a unique exposure that it is shaded for up to two hours a day at the warmest time of day, making it suitable for growing Pinot Noir. The wines since 2010 have been crafted by winemaker Brian Denner, a graduate of California State University at Fresno, who has worked as cellarmaster at Williams Selyem Winery and has made premium wine professionally for 17 years. A Tuscan-styled tasting room offers views of the Cascade Range and a wine cave houses barreled and bottled wines. Once all plantings have reached maturity, the expected production of estate Pinot Noir and Chardonnay (and Syrah and Port) will be 3,000-3,600 cases. Visit the website at www.dancinvineyards for more information or to buy wines.